Montreal, QC – January 17, 2019 – At a presentation today in Montreal, the Kia Forte has been named Best Small Car in Canada for 2019 and the Kia Stinger has been named Best Large Car in Canada for 2019, winning their respective categories as part of the judging for AJAC’s Canadian Car of the Year and Canadian Utility Vehicle of the Year and qualifying them both for the overall awards to be named in February. 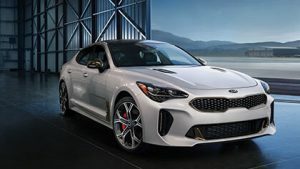 (TORONTO) May 22, 2018 – Kia Canada Inc. (KCI) today announced that, starting later this summer, the 2019 Kia Stinger will be available in Canadian dealerships with a choice of Kia’s 3.3L Twin-Turbo GDI 6-cylinder engine or Kia’s 2.0L Turbo GDI 4-cylinder engine. 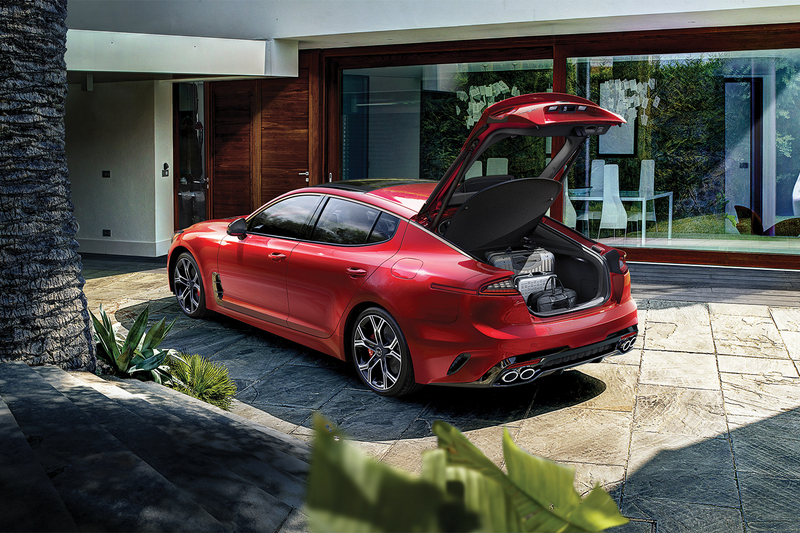 The new 2019 Stinger 2.0L GT-Line AWD will feature many of the same design attributes that has made the 3.3L version the talk of the industry, while providing an opportunity for even more Canadians to get into Kia’s award-winning sports sedan. Cars today need to do more than provide a means to get from point A to point B. That’s where the 2018 Kia Cadenza comes in. It’s a spacious luxury vehicle with Kia’s warranty to match. Take a look at just some of the features that put it head and shoulders above the rest in its class. There is plenty for families to love about the Cadenza. It has plenty of legroom for all passengers, making long trips with its full complement of five passengers a breeze. It’s a quiet ride as well, with sound dampening features that ensure the sounds of the road stay outside. Kia’s UVO services add that extra layer of security as well, allowing you to locate your car, track its speed, and even set curfew alarms when you’ve handed off the keys. Safety doesn’t stop with remote tracking. A fully loaded Cadenza has enough features to make sure the only memories you make on the drive are good ones. The surround view camera lets you keep a close eye on your vehicle’s perimeter, while front end collision sensors and emergency braking automation help out in a pinch. Follow that up with cross-traffic alert in the rear and lane change assist and the driver is kept aware of everything around. Everyone relies on technology, and families most of all. That’s why the Kia Cadenza comes with a wireless phone charger, and access to Apple CarPlay and Android Auto. Whether you’re singing along with the kids or to by yourself with your favorite album, you’ll appreciate the 12 speaker integrated soundsystem. Connecting it all is an optional 8 inch touch screen, keeping all of your news and navigation right at your fingertips. With more time spent on the road, you need more than car. 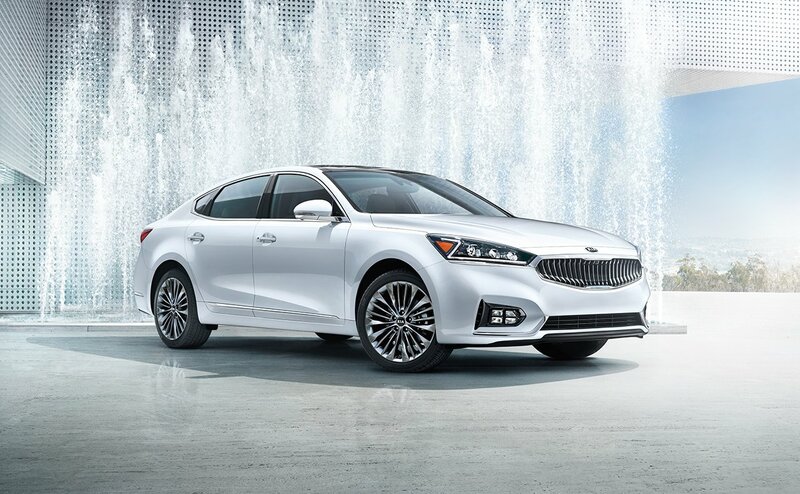 Let Peterbrough Kia introduce you to the 2018 Kia Cadenza, the auto that is more than transportation; it’s part of your life. Kia has long been slept on when it comes to rating midsize sedan luxury, performance, and overall style. Those days have now come to an end with the all-new 2018 Kia Stinger, a sporty, elegant take on a sedan well known for its reliability and easy handling. Peterbrough Kia has been anticipating this highly-acclaimed Kia model for some time, which is why we’re excited to present the characteristics we believe elevate the Kia Stinger into a class of its own. The Stinger is available in five trims: 2.0L, Premium, GT, GT1, and GT2; all of which can be upgraded to all-wheel drive. The 2.0L trim, the most affordable of the lot, doesn’t skimp on luxury or performance with its push-to-start button feature, 8-speed automatic transmission with paddle shifters, and premium fuel recommendation. The Premium trims features all that the 2.0L trim has, with the addition of a navigation system, a sunroof, and high-performance dampers. The GT trims feature upgrades like electronically controlled suspension and shift-by-wire-capabilities, making the Stinger a competitor worthy of the auto world’s attention. What sets the 2018 Kia Stinger apart from the rest is that even its lowest level trim boasts a supremely luxurious interior. The 2.0L trim features leather seat trim with heated front seats, a first for Kia lower-end trims. As you get up to the higher-level trims, the Stinger becomes available in Nappa leather seat options, premium sound system upgrades, and advanced driver assistance systems. The Kia Stinger’s performance easily rivals that of luxury brands such as BMW, Lexus, and Mercedes. Not only can all Stinger models be upgraded to all-wheel drive, they also come with turbo-powered engines. However, each engine differs with each trim. The 2.0L and Premium trims feature an I-4 Turbo GDI engine with 255 horsepower and 22-city/29-highway/25-combined MPG. All of the Stinger GT trims feature a 3.3L V6 Twin Turbo GDI with 365 horsepower and 19-city/25-highway/21-combined MPG. A car is likely one of the most important purchases you’ll ever make. When you visit us at Peterborough Kia, we’ll treat you like family and guide you through purchasing a vehicle. 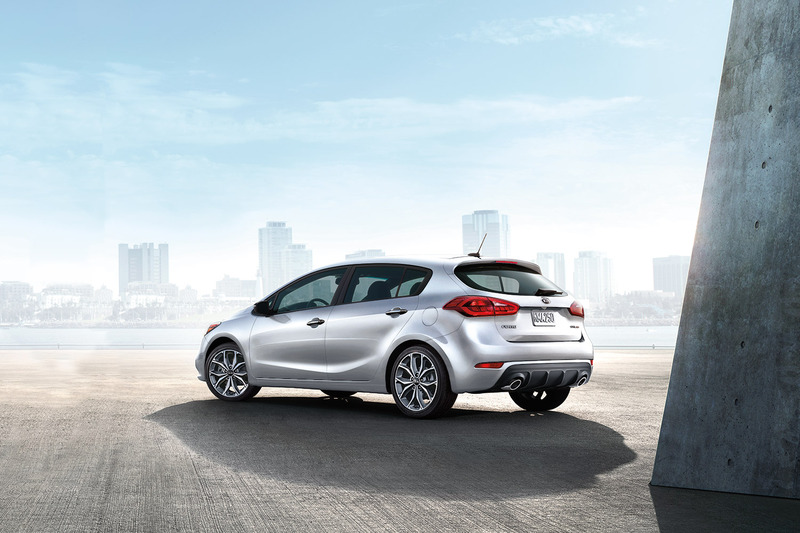 Whether you’ve already conducted thorough research on your own or are still not quite certain that the 2018 Kia Forte5 is the car for you, we’re ready to provide the assistance needed to help you feel at ease. Like many other models made by Kia, the 2018 Kia Forte5 has both active and passive safety features to help you manage the challenges that may arise when you’re on the move. For example, the lap and shoulder safety belts have pretensioners that keep the restraints tight against your body in certain conditions. There are also components that help you adapt to icy or wet roads by maintaining consistent traction, as well as one that keeps the vehicle stable on inclines. Most of today’s leading models accommodate a high-tech lifestyle, and this model from Kia is no exception. It’s compatible with most Apple and Android smartphones, allowing you to get the most from those gadgets while you’re on the road. Additionally, consider getting this car with an available rear camera system that shows you what’s behind the vehicle as you back down the driveway or out of a parking spot. Some obstacles are difficult to see, especially if they’re low to the ground. By looking at the viewing screen built into your dashboard, you’ll be able to move in reverse without worries. Whether you’re in the market for your first car or want to buy one to accommodate your growing family, come visit us at Peterborough Kia today. We’re excited to give advice at every stage of the process and help you purchase a car you’ll love to own and drive. Superior style, performance, and handling, the latest Stinger is Kia’s attempt to challenge higher priced luxury brands. If you’re interested in luxury at a reasonable price, then the 2018 Kia Stinger may be the perfect option for you. Here are the key points we at Peterbrough Kia believe you should know about the Stinger. The 2018 Kia Stinger has five trim levels. The base comes equipped with features such as 18-inch wheels, front and rear parking sensors, keyless ignition, leather upholstery, Bluetooth, heated front seats and steering, wheel, auto-dimming rear-view mirror, six-speaker audio system and satellite radio, Apple Car Play and Android Auto, and a 7-inch touchscreen. The Premium trim comes with a sunroof, an 8-inch touchscreen, a universal garage door opener, driver memory settings, and a 15-speaker Harman Kardon audio system. The GT, GT1, and GT2 trims offer more powerful engines and upgraded safety features ranging from forward collision warning and automatic emergency braking to lane departure warning and correction. The Stinger is easy to drive, provides quick, powerful acceleration, and responsive steering. Its 8-speed transmission chooses the gear that’s appropriate for the condition and adjusts smoothly. The Stinger provides comfort as good as any of its pricier, European counterparts. It boasts front seats with bolsters are comfortable during long-distance drives and hold you when cornering. With large cargo space and plenty of pockets and bins, the Stiner surpasses other hatchbacks in terms of cargo capacity. The rear seats can also be folded if additional space is needed for larger bags. The sound system quality from the audio system is somewhat lacking, but the laundry list of other features including the built-in navigation system and voice control more than make up for it. The 2018 Kia Stinger is not technically a luxury car. However, it comes awfully close and is perfect if you want to experience luxury on a budget. At Peterbrough Kia, we’re here to help you find the right car for you. Feel free to contact us should you have any furthers questions. Looking into getting a brand new car this year? Getting a new car can be great, especially knowing that nobody else has ever driven it before you. If you go to your local Petersborough Kia, you will probably find yourself looking at a wide variety of new models for you to choose from. Here are some features that may have you choosing the 2018 Kia Sportage. One thing to note about this particular brand of car is that it has an interior that reminds some reviewers of an Audi, making it have a great luxury feel to it. There are also many new features to keep in mind, such as heats that are not only heated but also cooled. What’s more, those that like speed and power will probably love the Sportage because of its turbo engine. There are a lot of ways that the 2018 Kia Sportage varies from the 2017 one. For example, there has been an increase in active safety features of this car, and many of the already standard features from last year have been updated. However, even with all of these nice new features, the car is still an affordable price for a lot of people, meaning that you don’t have to worry about high car payments, high interest or just turning this car into one of your dreams. There are, of course, upgrade options, however these will increase the price of the car; however, it includes some extra tech and an upgraded interior, so it may be worth the price to some people. There are a lot of reasons that you may want to look into the 2018 Kia Sportage, such as the increased technology allowing you to use Apple CarPlay or Android Auto as well as the new safety features that are becoming more standard. Consider looking into your local car dealership today. As with nearly any type of technology, automobiles have gone through a significant number of changes over the years. However, that change is not likely to stop anytime soon, and we are already seeing some potential changes to cars such as the 2018 Kia Sportage and more. From new luxury-based technology such as wifi and Bluetooth, to other sorts of more practical technology, here are some of the things you may see coming to cars in your local Peterborough Kia in the not-too-distant future. Electric cars aren’t necessarily considered new, however they are continuing to find their way into the spotlight with more changes. The idea behind the electric car is to reduce the need for fossil fuels, and although some of them still have a way to go before they completely replace conventional cars, they seem to be taking a step in the right direction. Another new change coming to the auto world is the autonomous, or self-driving, car. Like the electric car, these vehicles still have some kinks to work out before they are ready to hit the road in full force. However, with the ability to drive themselves and sometimes even make decisions in spite of the input of the driver, they may be a key to making the road safer for everyone in the future. Fingerprint unlock and entry is another new technology that is being talked about, although they haven’t quite made a breakthrough yet. This piece of technology could have the potential to decrease the likelihood of car theft, since the owner’s fingerprint would be necessary to unlock the car. However, it may be some time before we see this technology in cars on the market. With all of the new tech coming out, it should come as little to no surprise that people are starting to get excited about what the future holds for the auto industry. You may even find yourself browsing for a new car at your Peterborough Kia dealer.